Kohli played a mindboggling knock of 149 runs and single-handedly bailed his team out of trouble. 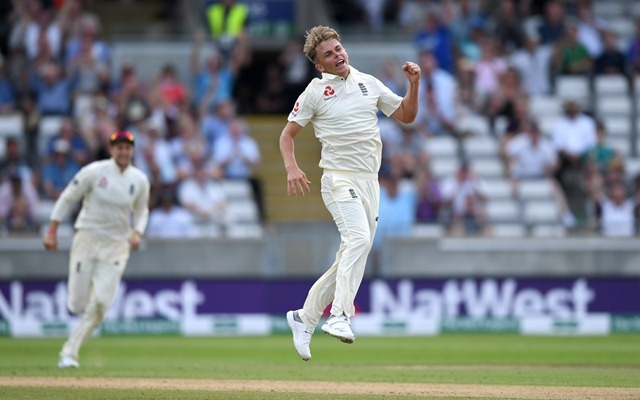 He might have made a dream start to the Test series versus India, taking four wickets to floor the visitors’ much-vaunted batting line-up, but the 20-year-old Sam Curran also learnt a big lesson during the second day’s play as he witnessed the run-machine Virat Kohli‘s heroic knock. The left-arm pacer, son of former Zimbabwe cricketer Kevin Curran and playing only his second Test after making a debut against Pakistan in June, claimed the wickets of Murali Vijay, KL Rahul and Shikhar Dhawan in quick succession to put India on the back foot. But then Curran found Test cricket is tough thanks to Kohli smashing him for runs later in the day. It wasn’t that the Indian captain was authoritative from the word go and was also reprieved early on. But he made full use of the gift and went on to smash 149 off 225 balls to score his first Test hundred on English soil, something which was troubling his fans for a long time. For Curran, Kohli’s attitude of taking the fight to England after the initial hiccup was worth to learn from. “We had them 100 for five, and felt in the game then Virat played really well with their tail and frustrated us a little bit,” he was quoted as saying by India Today after the end of second day’s play. “I’m only in my second game, but I think it was a little eye-opener for watching the way he bats and how precise you’ve got to be with your lengths,” added the young bowler who finished with 4 for 74 to be the most successful bowler for his team in the first innings. India were bowled out for 274 in reply to England’s first innings score of 287, conceding a lead of 13 runs. Curran, however, also went on to say that Kohli’s luck was on his side today and things could’ve been different if Dawid Malan had managed to hold on to the straightforward catch when he was on 21. “He did nick a lot of balls outside off-stump that didn’t carry as well. We stuck to our plans very well against him, and on another day they would carry,” he concluded. Follow CricTracker for the latest cricketing trends and developments.